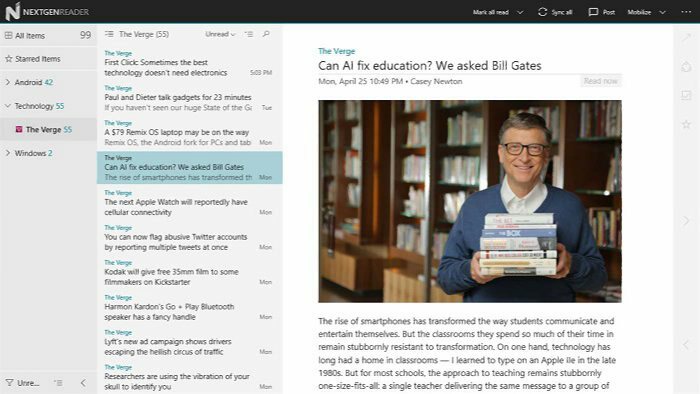 Nextgen RSS Reader app for Windows 10 is now free for next 24 hours. Normally the UWP app cost you $1.99. Nextgen RSS Reader is a feed client for Windows 10. Head over to Windows Store and download the UWP app for free. A standard 3-pane layout with full keyboard support. A beautiful grid layout for your touch-screen device or 2-in-1’s. Super fast, best-in-class, sync engine with offline support. Pin your favorite feeds to start from either list view or grid view. Set open method per feed i.e. summary/full article/webpage. You can get Nextgen Reader on your Windows 10 device from the link below.